Swap the 4th July colours for Christmas colours and I was set. Omitting the traditional Christmas green, has meant it's not too Christmassy and can be worn at any time, but the strong red gives it a definite Christmas feel. I rather like the back view of the skirt. 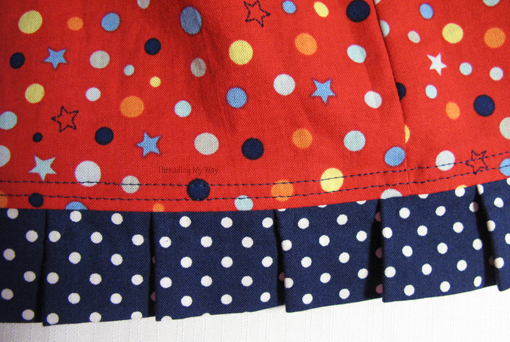 The little pleats are a great way to trim the bottom of the skirt. The tutorial suggests either pleats or a ruffle, but I thought I'd deviate from my normal ruffles and go with the pleats. I'm really pleased I did, as I think they suit this skirt. 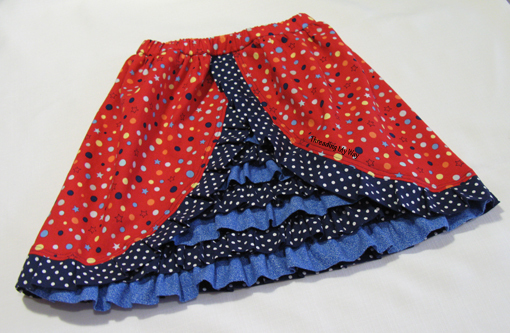 The standout feature is the panel of ruffles, peeking out from underneath the skirt. As was to be expected, this was the part of the project which took the longest to sew. This is where I deviated from the tutorial ever so slightly. 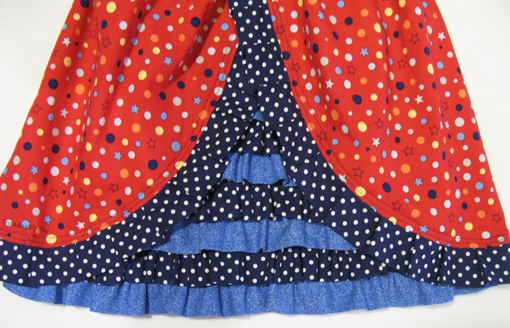 The tutorial suggests attaching the ruffled panel, by sewing over the existing top stitching, sewn to keep the pleats in place. I didn't like my chances of sewing exactly on the same line of stitching, so I sewed a 2nd row of top stitching outside the first and continued this all the way around the skirt. 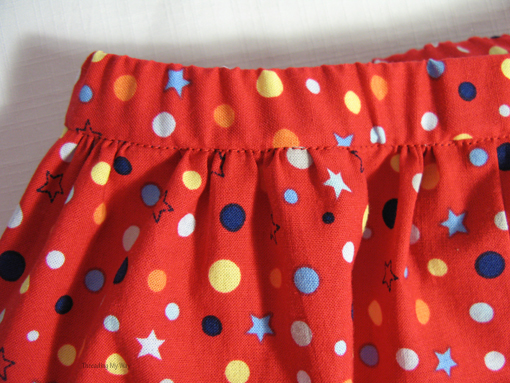 The waistband is made by adding a separate piece of fabric to the main skirt. This allows for fullness in the skirt, without bulk around the waist, making a very comfortable piece of clothing. The tutorial assumes some prior knowledge in making the waistband casing, as well as when gathering the ruffles and making the pleats. 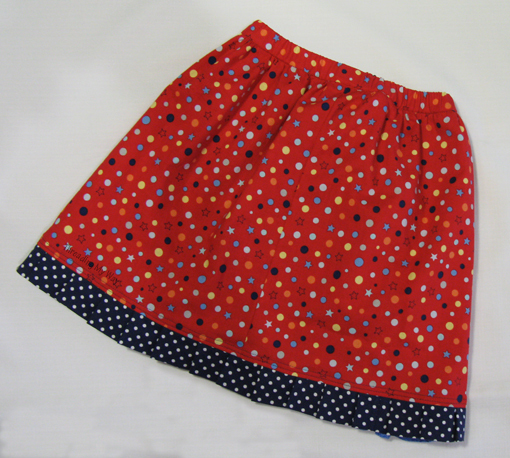 If you have made simple skirts before and are after something that is slightly more challenging, then this cute, girlie skirt might be just what you are looking for. The tutorial contains LOTS of photos, with step by step instructions. I'm thrilled with how the skirt has turned out!!! 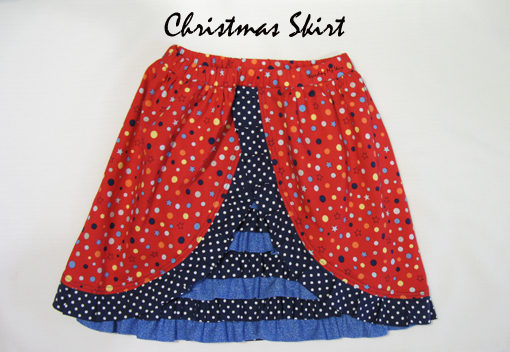 It's going to be perfect for Christmas, teamed with an appliquéd t-shirt. This post was originally written for She Sews. Cute Cute Cute :) If the blue polka was green polka fabric it would look great too..
Oh my gosh LOVE IT!!! love the ruffles. Pam, I love the skirt you've done, it's beautiful. It is so cute and the double stitches look great! Oh, Pam, it is super cute! You did a great job and I am sure it she will wear it all the time! Pam, this is really cute! I would have added some Christmas green, but certainly I understand that this gives more versitility. Agian little girl skirts are so cute. We love them. Thanks for sharing this. Gorgeous skirt Pam! Love that ruffle panel - it's so cute! So adorable!!! Love the colors and fabrics! How precious....but everything you do is always wonderful! Thanks for sharing. This is adorable! I love that you used her idea and put a Christmas twist on it. I love that you did pleats instead of ruffles too. Pleats often get forgotten. So fun. I love the ruffles, they remind me of a Christmas tree. So, so cute!! Love everything about it.